Kingston Head Post Office was designed by Robert Richardson in the Gothic style in 1875 on a prominent civic corner in Kingston. Shortly after it was opened it was extended to accommodate a large Parcel Post Sorting Office. In 1908 a large purpose built Telephone Exchange was built on an adjacent site, designed by John Rutherford in the Arts and Crafts style. It remained in operation as a Telephone Exchange until 1938 when it became too small and was converted to additional sorting and staff facilities for the Post Office. In 1984, the former Telephone Exchange was closed and sold to private developers, followed by the main Post Office in 1995. Attempts to redevelop the wider site have been unsuccessful since, and both Grade II listed buildings are now is a state of considerable disrepair. Both are now on the English Heritage Buildings At Risk Register. 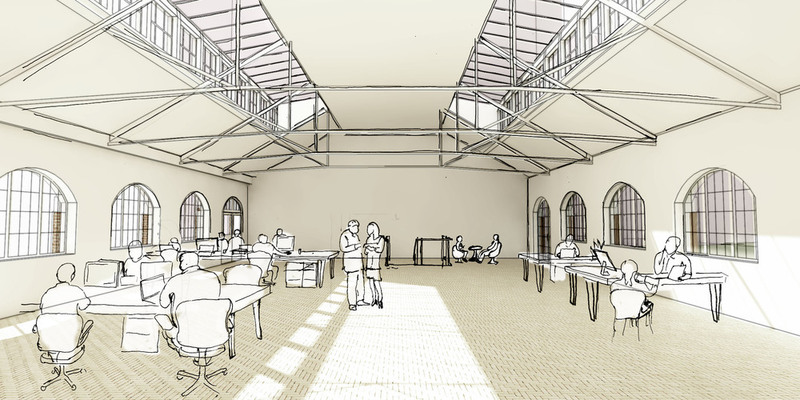 Following acquisition of the site by St. George PLC in May 2014, Malcolm Fryer Architects were appointed through competitive interview to explore options for the adaptive re-use of both buildings as part of a wider mixed-use master plan by John Thompson and Partners. Following an extensive options appraisal stage it was established that the former Post Office and Sorting Office should be redeveloped ‘in the round’ as a series of large commercial eateries off a new public square at the heart of the redevelopment site, creating a destination in its own right. The upper floors have been designed to operate as independently accessed community facilities for Kingston, incorporating the magnificent original switching room. The Telephone Exchange, which had once been heavily hemmed in by other buildings will become a prominent entrance to the site under the developing master plan. While it was found to be most suitable as a commercial facility, the major challenge for Malcolm Fryer Architects was to create a strong and welcoming entrance to the site on what was once the hidden flank elevation. MFA have carried out an extensive condition survey and repair schedule to accompany the Listed Building applications. The scheme has been the subject of extensive community and Statutory consultation, in which MFA have played a leading role.